Potato salad is an essential dish in the spring and summer months and can be a true crowd pleaser. This light version of homemade Potato Salad with Anchovy Vinaigrette is made with fresh ingredients all around. The light vinaigrette is made from anchovies, olive oil, lemon, garlic, dijon mustard, shallots and apple cider vinegar. It’s so darn delicious and makes the perfect side dish for your barbeque, brunch, or pot luck. 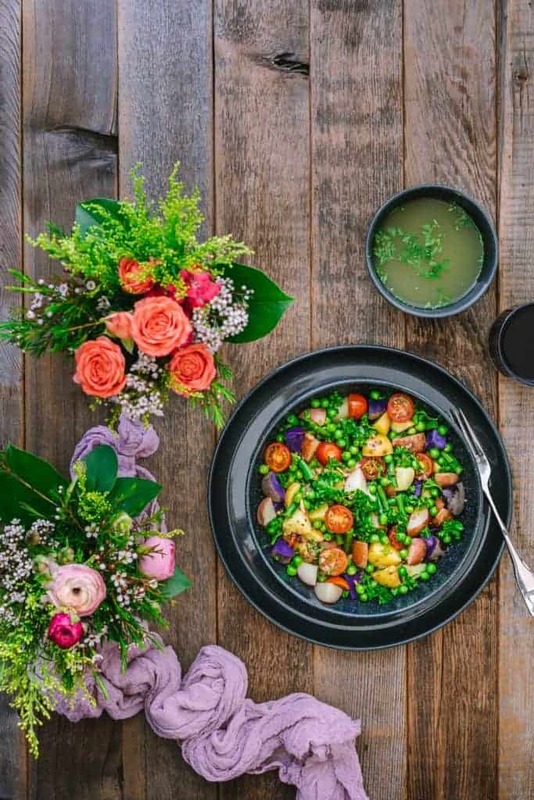 If you are planning to host a spring or summer outdoor dinner, lunch in the garden, picnic, or pot luck then this refreshing and light potato salad recipe is perfect for it. I think it’s a nice touch with the anchovy vinaigrette (if you don’t eat anchovies, the dressing is still tasty without them). I used my new favorite dinnerware collection from Dansk for this meal. They look so classy and the color of the food just pops against it (as does this bright dish). I’ve already plated quite a few meals on this set and every time it makes my food look better. 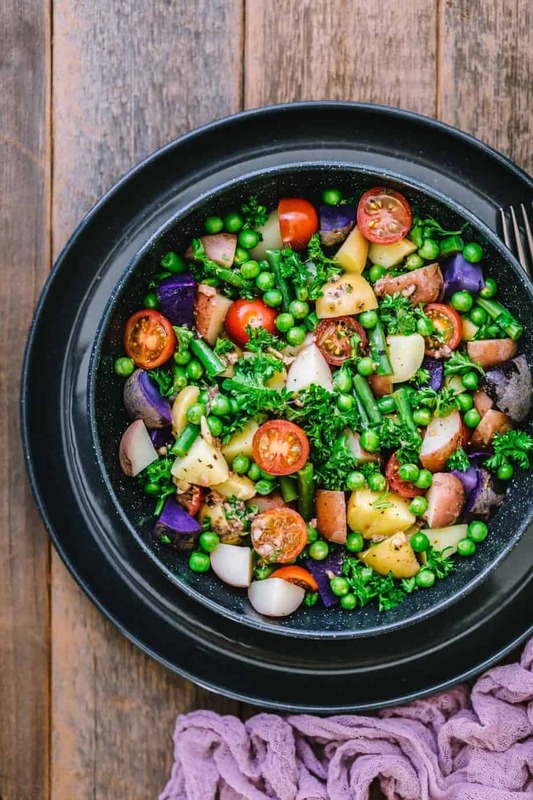 This Potato Salad with Anchovy Vinaigrette contains fresh vegetables of purple potatoes, yellow potatoes, white potatoes, red potatoes, green beans, tomatoes, fresh parsley and green peas. It’s so nutritious, and filling. Skip the bottled salad dressing, because this anchovy vinaigrette dressing recipe is tangy and flavorful. It’s a refreshing way to top this and other salads. This salad was easy to create but I personally think it looks beautiful with its varying colors, so your dish can be the star of the potluck. Potatoes are loaded with nutrients including fiber, vitamin C and potassium. Potatoes also free of fat and cholesterol. Green beans are a good source of fiber, potassium, and folate, and are an excellent source of protein, iron, and zinc. Tomatoes are also a great source of vitamin C, potassium, folate, and vitamin K.
When I am plating food, my goal is to make the food look attractive and appetizing. People eat with their eyes first, so if one of my guests thinks my food looks good I’ve reeled them in and they’re more likely to eat and enjoy. I take pleasure in experimenting with contrasting colors and textures to make the food as appealing as possible. 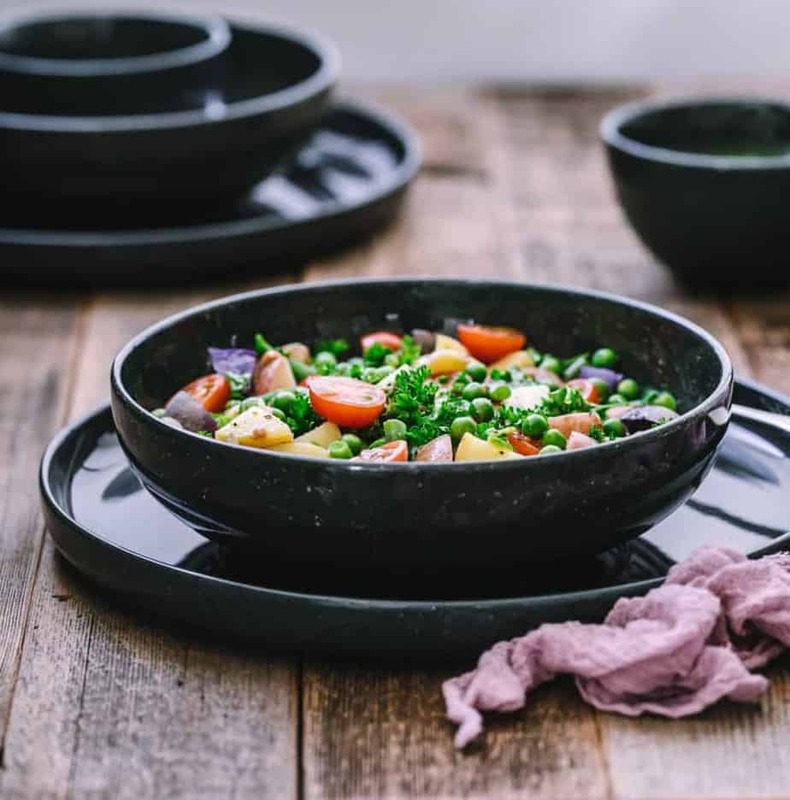 The color of this Raina Smoke Dinner collection from Dansk goes beautifully with dark greens, light greens, blues, white, orange and more. It has a neutral base yet has tones that are unique, something I’d expect from Dansk. As I mentioned on a previous post, I’ve been a big fan of Dansk for my entire adult life. They always create beautiful designs on cookware, dishes, plates, flatware and serveware. Their dishes are made to last and don’t scratch or chip nearly as much as other brands I’ve used in the past. This season I wanted to try something new to refresh my dinnerware collections that are mostly light or bright colors. I chose a polished finish and speckled charcoal surface of the Dansk Raina™ Smoke Dinner collection, as its flexible to work in a “country kitchen” feel like I have here, to the look of a modern kitchen with whites and grays. The dinnerware is microwave and dishwasher-safe which makes everything easier and faster for me, big plus! I’ll use bowls and plates ten times more based on those two factors. I am so happy with my choice from Dansk, it’s completely beyond my expectation. I hope you enjoy this Potato Salad with Anchovy Vinaigrette recipe, please let me know if you try it out! You can visit Dansk website to check out the Raina Dinner collection. This light version of potato salad is made with fresh ingredients, and a light vinaigrette, made from anchovies, olive oil, lemon, garlic, shallots, apple cider vinegar. It’s so darn delicious, the perfect side dish for your barbeque, brunch, or pot luck. Bring 5-6 cups of water to a boil over high heat. Place potatoes and 1 1/2 teaspoons of salt, reduce the water to medium-low and simmer until the potatoes are full cooked or tender for about 15 minutes. Whisk oil, dijon mustard, vinegar, fresh lemon juice, a pinch of pepper, a pinch of salt in large bowl. Add chopped anchovies, garlic, shallots, give it a stir and set aside. Drain potatoes and green beans thoroughly, drizzle some vinegar and gently toss. Let it cool for 15 minutes. Add chopped tomatoes, fresh parsley, and green peas. Drizzle with generous amount of anchovy vinaigrette dressing. Serve immediately and enjoy. I love the nutrition in this dish so many vitamins and fiber. I would love this and will use al your ideas in my own dressing and salad. Love your dish wear. The colors are so pretty. Looking forward to giving this recipe a try though, it looks really savory. well this certianly looks delicious and i love how you photographed it- the colors are breath taking! it looks easy to make too! Yum! Oh wow, yum. I’ve never had potato salad like this, so I am intrigued. I need to try this for sure. It looks incredible. I’ve never done a potato salad like this, but boy I’m telling you it’s going to be worth trying. I’m always looking for new flavors on items that are typically very regular. This is definitely a way to explore that. I get why they say you eat with your eyes first! Beautiful dish. Your potato salad recipe looks so gorgeous! It is great that you have this vinaigrette to add extra flavour to this dish. These dishes are also gorgeous! I have to keep them in mind when we go looking for dishes. Oh wow! This is heavenly delicious! I love this kind of salad! So many health benefits and you have so cool plates! Amazing! This salad looks so good! I think this would be great for a summer meal. 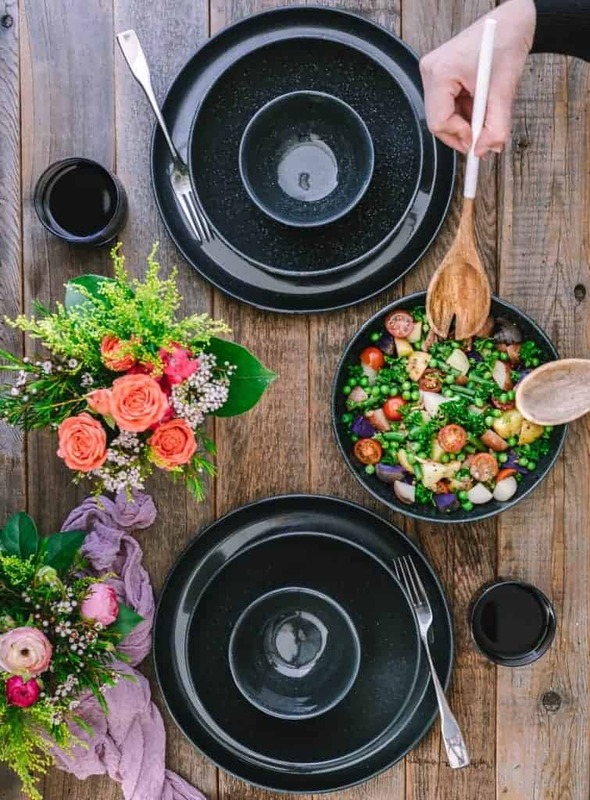 I am also loving those dishes, with the pop of dark color of the plates and the bright colors of the foods really make it stand out. Both your dish plus the serveware looks so beautiful! I also love how there’s so much color in your salad – delicious! I have never tried having anchovy but it is one of those things that I’ve been wanting to try. Your recipe looks divine. Can’t wait to try it. What a perfect yummy delicious veggie recipe. Thanks for sharing your recipe. Wow. This salad looks perfect! I love the photos, it makes me want to make this salad now. 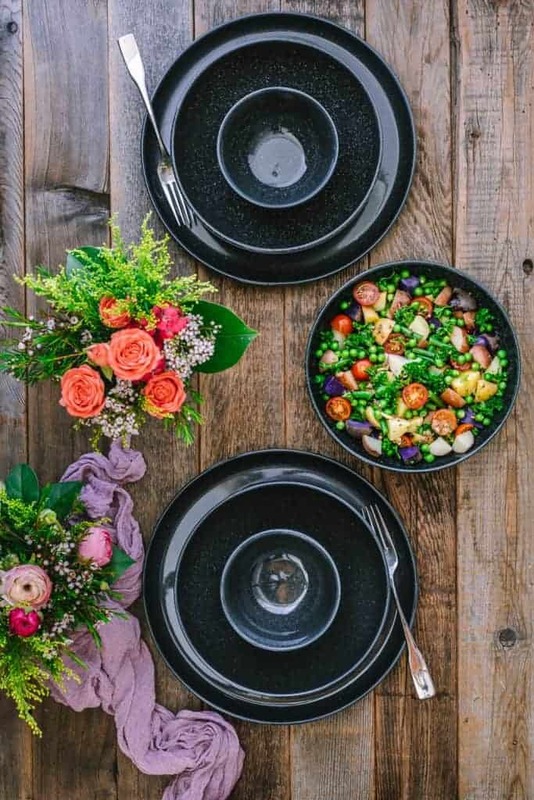 I love the speckled charcoal surface of these dishes AND the fact that they are microwavable! I am so curious about the anchovies vinegarette. I wonder if it is like a light Caesar. The dishes are really cool looking. This dish looks amazing. Plus that picture is so good.